January 2014 – Damn, I Can Make That! One unusually chipper morning, I thought I’d be a little overzealous and make a fancy breakfast/brunch. I had tried these lemon ricotta pancakes in a cafe when visiting Sonia in Philly and have wanted to put my own twist on them ever since. I have to say, they did not disappoint! They’re amazingly refreshing, and made for an awesome brunch. For the compote, cook the berries and maple syrup over medium heat until they start to get soft and saucy-like. (Around 3 minutes). For the melt-in-your-mouth pancakes, whisk together the ricotta, flour, yolks, sugar, butter, lemon zest, and vanilla. Unfortunately, at this point you have to dirty another bowl (personally, I hate doing that). In another bowl beat the egg whites on high until foamy and fold in to the other mixture. Heat your griddle/pan to medium heat, and get to makin’ some pancakes! 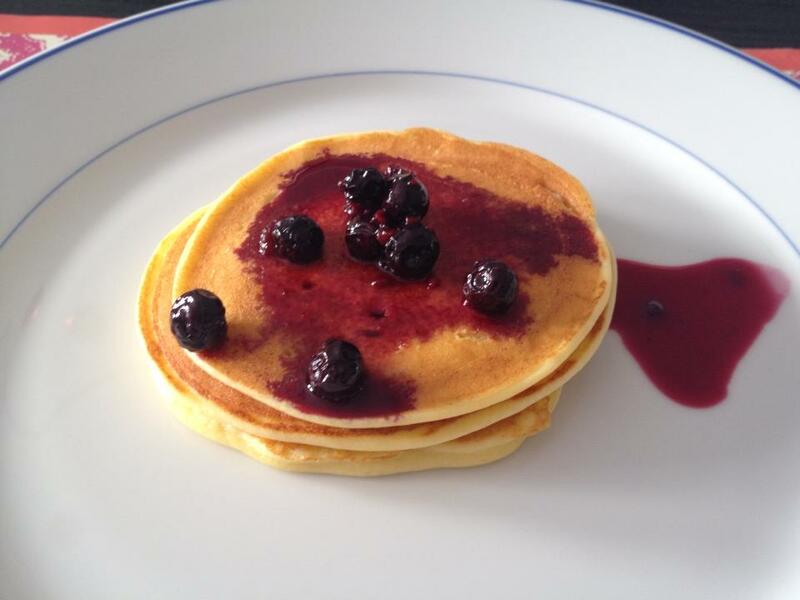 When the pancakes are done, pour on a little compote and syrup (tastes good AND looks good). And Don’t forget your mimosa! Even if you are not a football fan (gasp! are there such people still in the world?) I am sure you are doing something for the big game. (Super bowl is THIS Sunday kids, get with the program). I am also sure of the fact that we could all lay off the nachos, wings, pizzas, etc. that come along with watching the game. (Plus after 17 weeks of it, I think I have had my fill of hot sauce induced Sunday eats). However, since snacking is a must, but calorie overload doesn’t have to be. Here is an easy, quick, and healthy recipe for the game day munchies. garlic powder (I added a dash of dried oregano because I like the freshness the little green specks add). Preheat oven to 375. Unroll crescent rolls and separate into 8 triangles. Place 5 slices of turkey pepperoni on each crescent roll. Top pepperoni with string cheese half and roll up. Sprinkle crescent rolls with garlic powder & a pinch of the dried oregano. Place rolls on baking sheet and bake for 12-15 minutes, or until golden brown. Serve with a side of warm sauce. I can’t even begin to tell you how much fun I am having researching Super bowl snack ideas. I wanted to be different, fancy, yet still healthy. I’d rather waste my caloric intake on beers vs. food for a change. I have a pot luck party to go to so why not show off a little instead of bringing the blasé, typical healthy option of veggies and dip?! This recipe is just as good for you, I mean 5 mushrooms are only 79 calories!!! AND as if you needed more convincing, it takes 10 whole minutes to throw together. How much more fab can these get? Comment below on your thoughts, twists, ideas. 3 oz. lump crab meat (I upped it to 4 oz. because I ADORE crab). 1 tsp. of tony cacere’s (no salt since the seasoning already has salt). pinch of dried parsley flakes (again I love the freshness a little green adds to a dish). Mix all ingredients well and pop off the stems to the mushrooms. Fill caps and bake at 375 degrees for 15-20 min or until tops are crisped brown. I know most people think of soups, stews, or even chili when the weather is cold. 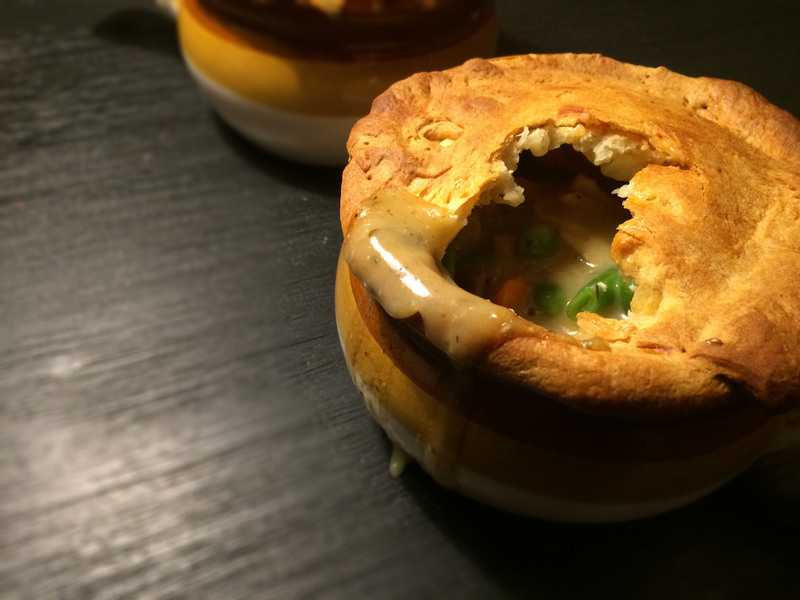 However, nothing screams “snowed-in winter” to me more than Chicken Pot Pie. Its filling, creamy, hot, and so, so, sooo yum. Luckily, its still sweatshirt weather for the next 6-8 weeks based on where you live so quit freaking out about how much you are cheating on your weight loss resolution & get to baking this puppy now. It’s beyond easy because all of the ingredients are cooked & all you have to do is toss & pour. No culinary skills needed! Grab a 9 inch pie dish, spray with cooking spray before laying the first pie sheet down. Take the remaining ingredients and mix well. Pour into bottom pie shell & cover with other pie shell. Crimp edges to seal shut and cut two slits in the center to let the air escape when baking. Optional: brush with egg wash (that’s just one egg beaten with a tbsp. of water) on top for a golden-looking crust. Bake at 375 degrees for 30-35 min or until top browns. *If you want to make it as pictured, use Pillsbury crescent rolls and 2 ramekins. Roll out to 1/2 inch thick and use a pizza cutter to cut in to four squares. Drape one of the squares on bottom of the ramekin, while pulling the edges up and over. Fill, and drape the top with another square, pressing the edges together to seal. “New year, new us!” I know, I know, you’ve heard that saying now a bazillion times. (I mean, I’m practically rolling my eyes at it). But it’s true – we have some new exciting things we’ll be adding to the site! Each month we’ll be featuring a new “foodie fave”. There are some amazing, drool-worthy food blogs out there and we want to share the deliciousness with you. You can check out a few of our current faves on our Pinterest page. We’ll also begin featuring some damn good restaurants around our towns – from Stamford to NYC to Philly (and even the occasional shout out from our hometown of Pittsburgh.) Half the fun of being a foodie is the experience and the atmosphere, so why not give our local restaurants some love? If you have any restaurants you’re obsessing over (no matter where you are), share the love! Tweet us @damndelish.